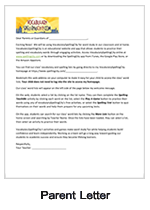 VocabularySpellingCity has many printable resources, including handwriting worksheets, vocabulary printable worksheets, spelling worksheets, and printable versions of many of our games. Users have the right to copy these printable worksheets as long as the copyright information remains visible! Download and print series of classroom activities and resources. Printables include a shades of meaning icebreaker lesson plan and activity, an all about me activity sheet, a literary genre poster set, K-2 phonics coloring pages, and a student certificate of achievement. Use during the first weeks of school or throughout the year for fun hands-on learning. You can create a printable version of your list. To print out your list, log in to your account and go to your List Management page. Find the list you wish to print, then select the Print link in the Actions column. You can choose to include sentences, definitions, and parts of speech, as well as synonyms and antonyms (when available) on your printed list. Click here to see an example of the list. Print out a handwriting worksheet on which you can choose between print, D’Nealian font, cursive, or sign language; arrows on or off; lowercase and uppercase; small, medium or large type size; and alignment to the left or right. Just find the list you’d like to create a handwriting worksheet for and select Print a Game. Then select Handwriting. Choose from the different options, then select the Print link. Click here to see an example. 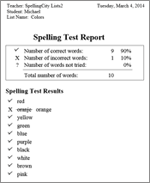 You can print reports showing the results of a spelling or vocabulary test, including a final score, the words that you got incorrect, along with the correct answers. You can also print out a certificate of your spelling test results. After you take a spelling test and the test results page appears, select the Print icon. Enter your name to personalize your report or certificate and select which one you’d like to print. After you take a vocabulary test, select View Results and then select the Print icon. Click here to see an example. VocabularySpellingCity.com licensed the technology for the worksheets from Downhill Publishing. They have an easy-to-use suite of products for teachers and parents that we highly recommend. With them, you can create your own printable handwriting worksheets using different font types and graphics. They’re easy and fun to create, and students love to learn with them. They also include worksheets for telling time and math.